Planning on putting plumbing that needs some extra support or do you have plumbing that is beginning to sag or rattle? If so, j-hooks are to the rescue! J-hooks are also known as ‘pipe hangers’ and there are many different kinds of them, but they all do the same thing and have the same basic design! 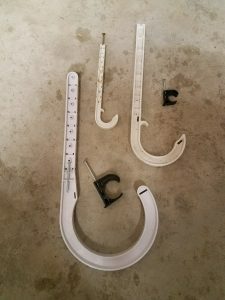 Most J-hooks are plastic and, well, shaped like a j. J-hooks are made to prevent your pipe from sagging or rattling and can provide you with some extra support for the pipe(s). Fun Fact of the Month – Mario and Luigi (of the video games Super Mario Brothers) are plumbers. MayesPlumbing, thanks for the article post.Really thank you! Great.